A U.S. Army soldier from Lawndale was killed in Kandahar, Afghanistan, when enemy forces attacked his unit with an improvised explosive device, government officials announced Friday. Koran Pulido Contreras, 21, died Thursday while fighting with the 2nd Battalion, 87th Infantry Regiment, 3rd Brigade Combat Team, 10th Mountain Division, based in Fort Drum, N.Y.
"I am waiting for the body right now," Contreras' mother, Lilia Contreras, said Friday evening from Philadelphia, not far from where fallen soldiers are returned to Dover Air Force Base in Delaware. The casket carrying the infantryman was expected to arrive about 8:30 p.m. Eastern time. Contreras and her husband, Marco, were there to meet it. "He had friends everywhere," his mother said. "Now I miss him. I am so upset." Contreras grew up in Lawndale, but spent a year in high school in Mexico before graduating from Leuzinger High School in 2007. He worked as a server at Cafe Boogaloo and as a cook at Shark's Cove in Hermosa Beach, before deciding to join the Army, his mother said. "He loved Hermosa Beach. He had a lot of friends," she said. "He liked skateboarding and the beach." 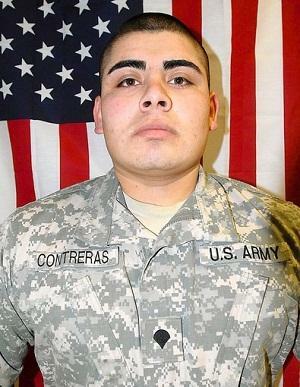 While serving in the military, Contreras spent a year in Iraq. He returned home, but was soon assigned to Afghanistan. "I worried all the time," his mother said. "He is my son." Contreras often wrote to and called his mother, telling her about his job and sometimes talking about what could happen to him. "I never thought it was real," she said. "Now it's true. It's so terrible for me." Contreras' 8-year-old brother, Anthony, looked up to him. "Sometimes he's crying," the mother said. "Sometimes he's so sad." Contreras told his mother he preferred serving in Afghanistan because of the landscape. It was green with rivers, she said. Another soldier, Pfc. Douglas J. Jeffries Jr., 20, of Springville, Calif. died in the same attack. Their deaths came three days shy of the 10th anniversary of the al-Qaida terrorist attacks against the United States in New York City and at the Pentagon near Washington, D.C. The attacks precipitated the war in Afghanistan. Koran Pulido Contreras, 21, of Lawndale.